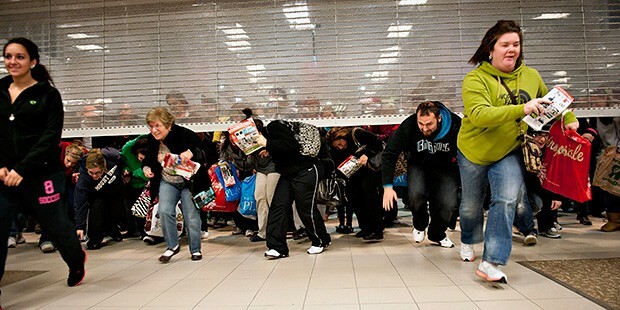 Black “Friday” comes earlier and earlier every year. A few years ago stores started opening at midnight, last year many opened at 10pm on Thanksgiving and now this year some stores are going to be open all day on Thanksgiving! This is an alarming trend that we as marketers need to stop perpetuating. Thanksgiving is a day for families to come together and give thanks for one another. Because it is not a religious holiday, Thanksgiving is often the only holiday that some families get to spend together. I think that if retailers continue to take away the sanctity of Thanksgiving, consumers (not to mention employees) will soon become resentful and in the worst case scenario become disloyal and begin to shop at retailers who support the same Thanksgiving ideals they do instead of shopping at whichever retailer has the best deals. The reason that the brick-and-mortar stores are opening earlier and earlier every year is to keep up with the online retailers. Best Buy began putting technology gifts on sale Nov. 20 and Walmart started offering free shipping on the season’s hot gifts as of Nov. 1. I propose that we either need to respect the Thanksgiving Holiday and go back to making Black Friday be a big deal ON Black Friday or we need to get rid of Black Friday and its sense of occasion altogether. I think we are going the way of the latter: according to a recent study by Accenture, 19 percent of Americans report that they’ve already spent between $100 and $500 on holiday shopping—having started as early as September—and 18 percent of consumers now believe the best holiday deals happen before Thanksgiving. I fall into this category – I purchased my Dad’s present back in October. Based upon Black Friday and Cyber Monday sales this year, it will be very interesting to see what retailers decide to do next year – If they switch over to a whole Thanksgiving week of deals or hit Black Friday harder than this year. Are you #TeamBlackFriday or #TeamShopOnTurkeyDay?